When the day is not cloudy, visitors can enjoy the views of the plains of Bangladesh. When the clouds rise from the plains and fly past the rock, the sights looks enchanting. Beside the rock is a viewpoint from where one can admire the lovely views. From the back of this giant rock, you can have a view of the winding roads of Cherrapunjee too. 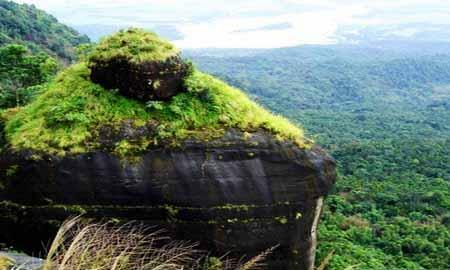 The ideal time to make a visit to this place is during monsoons. This is because during monsoon when water flows in between the rocks, the beautiful sight attracts the tourists for its one glance. How popular is Ka Khoh Ramhah? People normally club together Kynrem Falls and Double Decker Living Root Bridge while planning their visit to Ka Khoh Ramhah.